Right now, when you search for directions using Google Maps on your iOS or Android device, Google can now show you a dedicated tab with information for ride services Uber or Grab in addition to car, transit, or walking. So when you’re leaving work to meet a friend for dinner, you can easily compare your options to find the fastest way there, without having to open multiple apps. 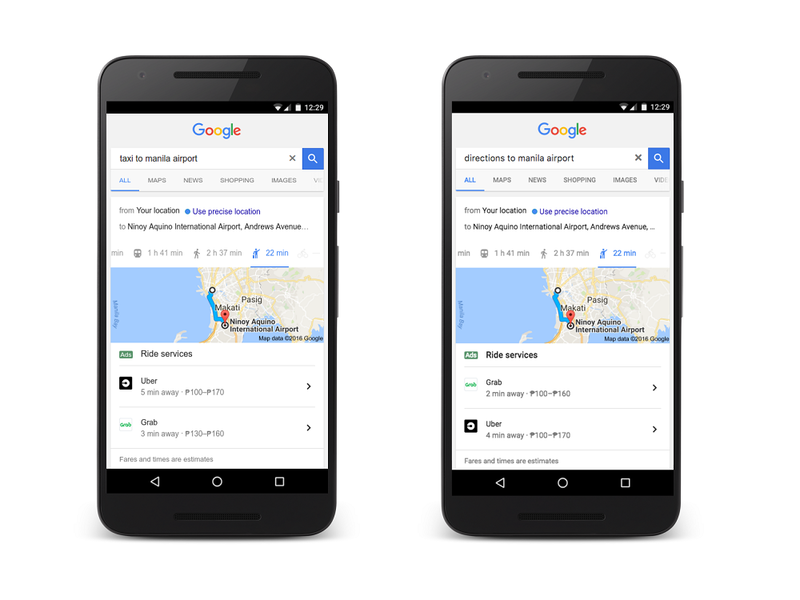 Today this gets even easier as you’re now able to pull up the same menu of ride service options straight from the Google Search app or your mobile search browser. Just ask for directions to a place, and you’ll see a tab for ride services with fare estimates and pick up times if a car is available near you. Or you can say, “Grab taxi/car/bike to Manila airport” or “Uber to Manila airport.” Select a service, and we’ll take you directly to their app to book your ride with one tap. If you don’t have an app installed, we give you a link to an app store where you can install.